Boston-based Guster performed to get fans in game-time spirits at the NFL Kickoff Concert in Boston before the first game of the Patriots season. 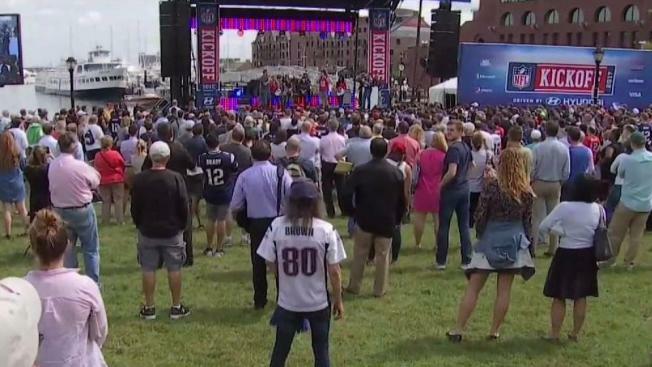 The musical act at the NFL's kickoff concert celebrating the New England Patriots in a downtown Boston park changed shortly before it started. Guster performed at the "2017 NFL Kickoff Driven by Hyundai" concert at Christopher Columbus Park Thursday afternoon. The Boston-based band replaced Grammy-winning artist Miguel, who had to decline performing due to an illness. Gates opened at 10:30 a.m. The show was a first-come, first-serve event. Those attending were asked to enter the event at the corner of Atlantic Avenue and Richmond Street.